Dior came up with a fantastically elegant make-up collection for Spring 2013, endearingly named Chérie Bow. The bow, apparently, "was Christian Dior favourite final touch, a timeless and emblematic code of the House of Dior", from which the current make-up collection draws inspiration to come up with a veritably girly treasure trove of delicate pastel pinks and powdery greys, that instantly made me think of a pile of pastel-coloured macarons and queen Marie Antoinette (one of the nail polishes is, in fact, named "Gris Trianon"). 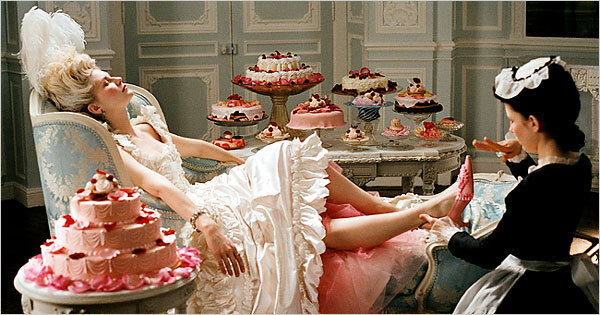 Kirsten Dunst as Marie Antoinette in the eponymous 2006 movie, directed by Sofia Coppola. The collection is almost unbearably cute, featuring an exciting, brand-new make-up innovation, the "Twin Set", or "the new eye-shadow pen", as it is presented on the Dior website, where it is additionally described as a double-ended pen, with a super soft pencil at one end and a foam blender impregnated with shimmery powder in the same nuance as the pencil at the other end. A bit pricey at £24.50, but I'm definitely saving up for one of these!! "Twin Set" in (L-R) Fishnet Black, Grey Sigh (pictured both ends), Ballerina Pink and Beige Ribbon. 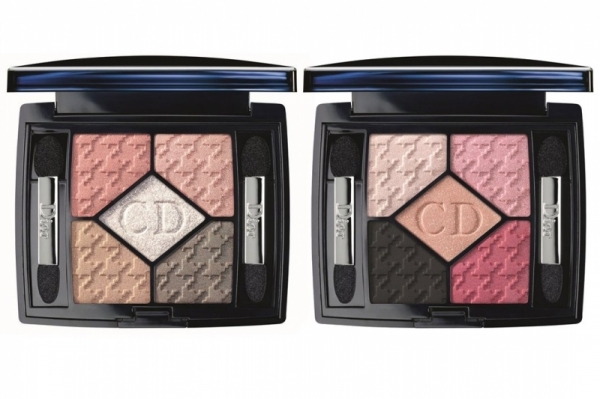 Then there are two new 5 Couleurs eye palettes, decorated with a hounds-tooth check motive which was a particular favourite of M. Dior himself. There are of course heaps of other products (four new shades of Dior Addict lipstick, two blushes, a gorgeous fuchsia lip glow and more...), but as I have a particularly soft spot for nail polishes...well, I'm going to drool over those for a while! There are three new shades of Dior Vernis and a new shade of Nail Glow in the collection, each more lust-worthy than the other, in my opinion! while Nail Glow is "a treatment nail varnish that makes pink pinker, and brightens nail tips for an instant French manicure look" (all quotes from the Dior website). With Tutu it was love at first sight, and I just had to get it and the Nail Glow. Currently I'm wearing one of my latest purchases, Chanel Emprise, but this afternoon I'm planning to take it off and paint a new mani in lovely Tutu. Or perhaps just paint a coat of Nail Glow on top of Emprise, just to see what it looks like! Oh, I'm excited already! !